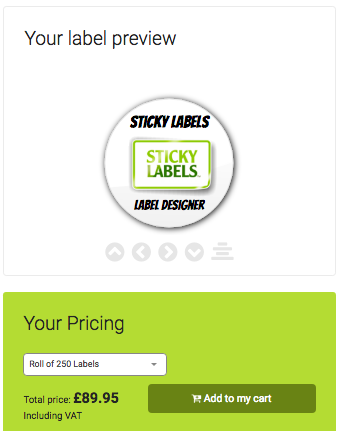 Sticky Labels Blog | Business Labels | Need a Company That Prints Stickers? Whatever your job, hobby or requirement, there’s a good chance that at some point you will need to find a reliable company that prints stickers fast! There’s plenty of these companies out there so finding the right one can see a bit like hard work and if you’re going to spend your hard earned money then it needs to be on a quality product that will be with you fast. We’ve seen sticker producers come and go over the years and lots of new technology that means you can print from home. Indeed, we even supply Avery compatible labels so you can do so. But with the hassle, cost and degree of knowledge necessary to print labels yourself, it is often easier and more effective to order your sticky labels online… From Sticky Labels™! We’ve put a lot of time, money and experience into creating our label designer so that you can literally design labels in minutes. If you were to design labels from your work or home computer then you will need to have (potentially) a number of custom pieces of software to get the job done, or a fairly in-depth knowledge of design software to create a sticker that looks decent. Even then, what may look great on a computer screen won’t necessarily look good when it is printed. You need to know what you’re doing with your PPI (Pixels Per Inch) and your DPI (Dots Per Inch) when it comes to printing anything. Even if you know your way around the software you use then you will need to read up on ensuring that the print quality will look right. Or… You could just use our label designer where we have already thought of that for you! Go and give it a try (even if you don’t want to order!) so you can see how quickly you can create your stickers and just how many options there are for customising every aspect of your label. You can even upload your own designs or if you want to have a completely custom shape vinyl sticker, we can do that too! It’s all really easy and we’re on hand to help and answer questions if you get stuck. Speed is important. We all like things done quickly and efficiently and we don’t always leave days or weeks to spare when it comes to ordering the things we want! 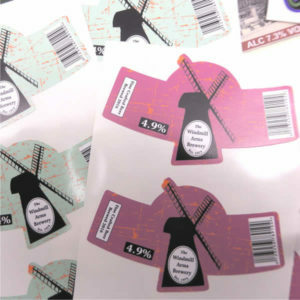 Luckily, we are a well-oiled machine at Sticky Labels so we can guarantee a two-day print and delivery service on all standard printed labels and on all custom vinyl labels (Which need to be cut out individually) we can have those printed, cut and delivered within 4 days! We really know our stuff when it comes to fast, reliable service so you can relax about the deadlines, knowing that we’ve got your back. We even offer a special ‘next day delivery’ option if you really are in a rush. You can choose this option at the checkout and for a small fee we will prioritise your stickers to the very top of the list and secure next day delivery on them so they will be with you as soon as possible! Did we mention that standard delivery is FREE? The price you see includes the delivery cost so there are no nasty surprises waiting at the checkout. 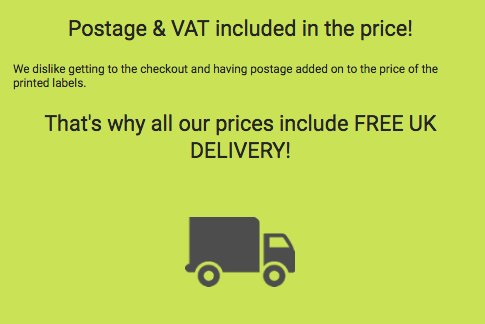 That always annoys us so we like to make sure we look after you by including VAT and delivery in with the price. It just makes sense. With so many companies printing stickers out there, the price is often a factor and we understand that but do be careful: Cheap prices often mean poor quality. Whilst we are competitive, we will not compromise on quality. We know that if you’re happy, you’ll come back: Our years of experience, well-trained staff and the specialised printing equipment we use means we can provide a level of quality that few companies out there can match. It’s important to understand that your labels are a reflection of your brand, your service or your products so you should never settle for anything less than the very highest quality! We know from the feedback we receive that the combination of speed, quality and price adds up to a service that simply cannot be beaten. We’ve printed labels and promotional material for over 40 years and adapted with the times to make sure that we provide a service that we’re very proud of and to be honest, the service that we would hope to be given when we order from a company ourselves. If you need a company that prints stickers online, you need those stickers fast and you need the best quality, then give us a try. We guarantee you won’t be disappointed and we’re confident that you’ll come back to us!